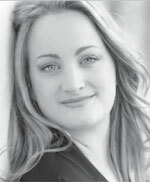 Scottish soprano Eleanor Dennis is a graduate of the Royal College of Music’s International Opera School. Her appearances at the London Handel Festival first brought her to prominence, it was in the title role of Rodelinda that she made her first major break-through. The critics were unanimous in their praise. Fiona Maddocks, reviewing her performance in The Observer, wrote ‘she has a marvellous future. I’m not sure I can ever remember one who so obviously deserves to be a star’. She returned to the Festival as Costanza in Handel’s Riccardo Primo, prompting Hugh Canning to call her ‘a big talent’. As a Harewood Artist at the English National Opera her roles have included Contessa Le nozze di Figaro, Micaela Carmen, Helena A Midsummer Night’s Dream and Laura Fleet in the world premiere of Nico Muhly’s Marnie. Elsewhere she has sung Contessa for Scottish Opera, Helena at the Aldeburgh Festival and Ginevra in Handel’s Ariodante at the Salzburger Landestheater. Recent concert highlights include Elgar’s Une Voix dans le Désert with the CBSO, Beethoven’s Egmont with the BBC Philharmonic, Strauss’ Vier Letzte Lieder with the Royal Philharmonic Orchestra, Britten’s Spring Symphony with the Vienna Radio Symphony Orchestra and Beethoven’s Missa Solemnis at the Three Choirs Festival.